I want to read the ever after high books too!! Did you read the Monster High books? I haven't yet, have you? I want to! No. I don't know about them, I don't really care for the dolls (younger cousin is obsessed with them) so I don't know how I'll like the books. I have heard that the second series of books is better than the first. Welcome to the 2014 Climbing Crew! 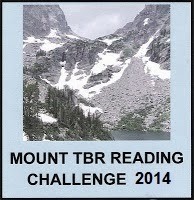 Good luck with whittling down that TBR pile.